Managing customers is quite different from managing inventory. With inventory, there are two systems: LIFO and FIFO meaning Last in, First Out, and First In, First Out. With a marketing customer database, the system we recommend is FISH, which stands for First In, Still Here!. The goal is to keep customers actively participating in our products and services for a lifetime. That is the goal of effective customer management. There are a series of steps that customers should go through as they enter our customer management system. We begin with acquisition – with acquisition being defined as finding first time buyers, and converting them into second time buyers. Only then do we have someone that we can profitably manage. Our next step is migration. We want to turn our acquired customer base into a strategic corporate asset. We must find out their needs, desires, and incomes. We learn their ages, family composition, occupations, lifestyle. 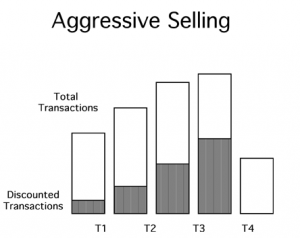 In the case of business customers, we learn their SIC code, annual sales, and number of employees. We learn their buying cycle, and their key employees: specifiers, influencers, decision makers, etc. The idea of migration is to convert these acquired customers into loyal customers, and even get them to become advocates: people who will sing our praises and refer other customers to us. The management process brings up the question, who owns these customers? Who will manage them? 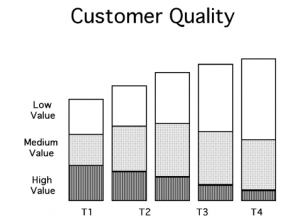 Who will work to gain the customer’s loyalty? 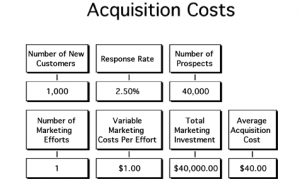 A company sets customer acquisition as a goal. Experience shows that discounted transactions bring in new customers. Over a period of four years, they aggressively promote acquisitions through discounts. In Year 4 they realize that, while they have succeeded in acquiring many new customers, their profits are seriously eroded by the discounts. They decide to eliminate all discounts. In Year 5 they end up with fewer real customers than they had in the first place. Discounting, in other words, is a serious trap. You educate the customer to think only about price, and not about the quality and services provided by the institution. The image of the bank, for example, is one of cheap discounts, rather than personal attention to its customers. All products suffer. In another example of similar problem, the restaurant manager of a large hotel notices that few people are eating in the restaurant on Wednesday nights. He decides to pep things up. On Wednesday nights, he brings in magicians, Mexican bands, belly dancers. He attracts a large crowd of locals who come for the excitement. Meanwhile, the regular businessmen who are the life blood of the hotel’s business find that they cannot conduct business in the restaurant on Wednesday nights. They decide to move to a quieter hotel elsewhere in town. The restaurant manager’s program has certainly increased traffic in the middle of the week, but what has it done for the hotel’s profitability? What has happened to the loyalty of its business customers? Who is managing the customers? 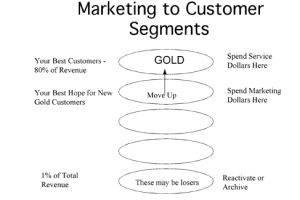 In another situation, a business to business customer manager sets a goal of customer retention. He succeeds: he doesn’t lose customers, and those that he retains do not decrease their spending. This may seem like success, until one looks at what has happened to these customers. The business of the customers may have been growing by 30% per year, but the company’s sales to these customers has not increased. By standing still, the company has been falling behind. 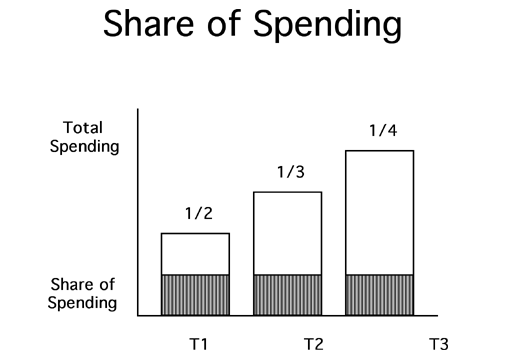 In other words, the proper measurement is share of wallet, not spending level. To know what our share of wallet is, we must have some information about the size of the wallet. We have to understand our customer’s business to understand our own business. A final example may illustrate the dangers of failure to manage the customers. Here is a company that aggressively promotes its customers. Visualize a company like the Reader’s Digest that has more than one hundred different products that it wants to promote to its existing customer base. Experience has shown, let us say, that single product promotions for this type of situation, are more successful than catalogs with scores of different products. There are not enough weeks in the year to accommodate 100 products with single item promotion? The company surveys its customers to determine their interests. They find out which customers are interested in children’s products, which like romance reading, which like current affairs, etc. This is good. 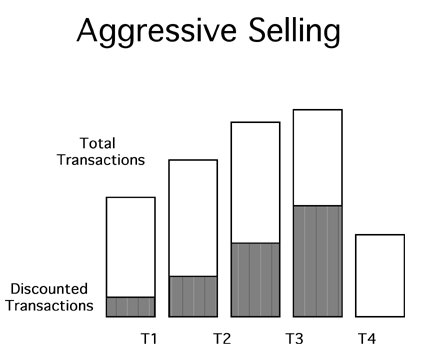 It is segmentation along interest lines. But then they make a major mistake. Of course, some customers have checked more than one category of interest. Some check as many as ten! Having created these segments, they begin to promote them aggressively. The manager of each category promotes like mad, trying to increase profits in the area of his responsibility. Some customers get one letter a month. Frequent responders get four or five a week! 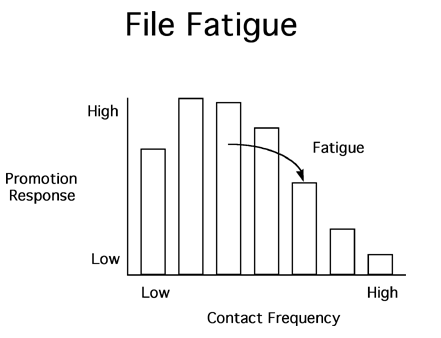 The result is what we call “file fatigue”. 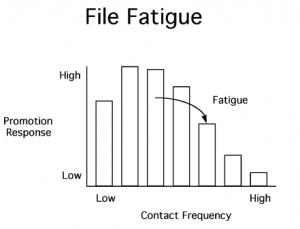 Your best customers are worn down under a deluge of mail. You have worn out your welcome. Each of the segment managers says, “I didn’t over-promote. I never sent more than one a month.” But as far as the customers were concerned, they were seeing several a week. They soon learned to chuck them out unread. Perfectly good, responsive, profitable and loyal customers had been ruined by over promotion. A failure of customer management. What is the solution in all of these cases: We must put someone in charge of the overall customer relationship. Someone must manage each segment, and be sure that they are being handled properly. We must not overpromote. We must watch the customer’s business to make sure that we grow with the customer. We must not offer discounts to our loyal regular customers. We must not degrade our service by cheapening our offering in the effort to build the body counts, while losing the high valued customers. 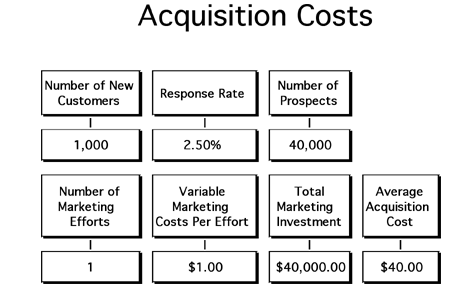 ROI = $100 / $40 = 2.5 — a good return on investment. 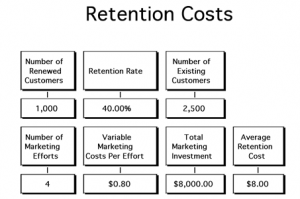 Let’s now look at retention. Lets assume that we set up a regular series of communications with our existing customers during year, designed to keep them interested and loyal to our company. Each of these communications costs us $0.80 each. We mail each customer four times per year. 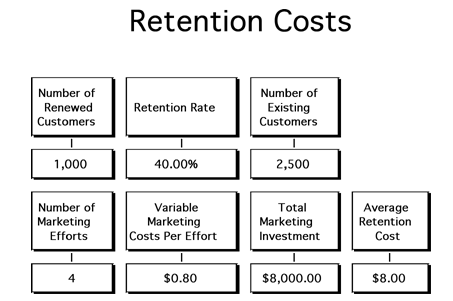 If our retention rate is 40% (which means that our annual customer loss rate is 60%) then our cost of retaining customers is $8.00 per customer per year. This is a much better return on investment than acquisition activities. What does this mean? It is much more profitable to work to retain our existing customers than to beat the bushes for new customers. We already knew that, intuitively, but here is the proof, which you can compute for yourself if you do your homework and compute such things as lifetime value, costs of acquisition and retention activities, and your success rates in these ventures. 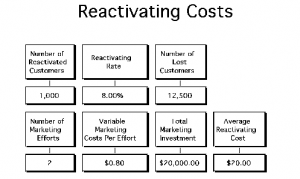 A final example shows the return on investment of reactivation efforts. We all have old customers who no longer buy from us. Which would be more profitable: to spend money trying to reactivate customers, or to spend the same money on trying to acquire new customers. Let’s take an example. 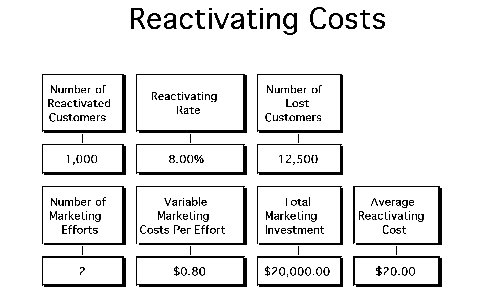 Suppose that your cost of reactivation is $0.80 per customer, and that you make two tries with each lapsed customer. Your success rate is 8%. What do the numbers look like? Conclusion: it is twice as profitable to spend money reactivating lapsed customers as it is to work to acquire new customers. This is effective customer management. But what do most companies do? Look at the advertising budgets of the typical company. Advertising $10,000,000. Database Marketing $1,000,000. The spending on acquisition is ten times the money spent on retention and reactivation combined! Look at your own company. We wager that your percentages are similar to those we show here. How well are you managing your customers? Investment in customer management has a long term payback. We can sum up our approach to customer management: Don’t try to be all things to all people. Learn about your customers, their desires, needs, and preferences. Segment your customers by volume, lifestyle, or any other category that is meaningful to the customer. Determine the lifetime value of each segment. Put someone in charge of each segment, which responsibility to retain that customer for a lifetime, and to sell her the entire company product line. Reward the executive for retention and sales volume. 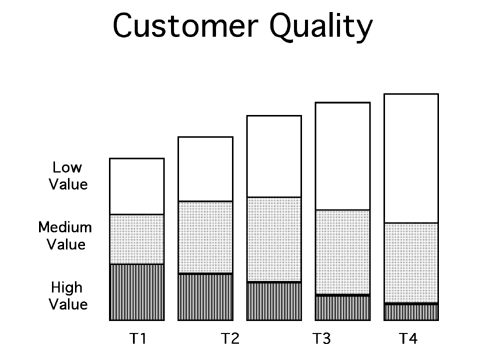 Recognize, also, that some customer’s lifetime values are very low, or even negative. Don’t waste money promoting these losers. It is more important to reach the people who count, than to count the people we reach.